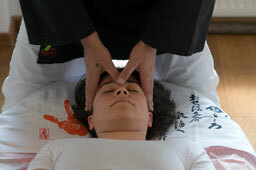 The duration of a shiatsu session is approximately one hour. Shiatsu is received with clothes, recommended that the garments are of natural tissue, spacious and comfortable. Avoid eating one or two hours before the treatment. The number of sessions and frequency range depend on the patient being treated, although a weekly session is recommended for maximum effectiveness. The therapy can be performed on a futon mattress or a stretcher. During the session it is not convenient to talk, observations are made at the end of therapy. We proceed to the application of therapy, continuous pressure, shiatsu, complete with stretching, joint rotations, moxibustion and Sotai ho. Fifteen minutes of sleep in a shiatsu session feels like two hours of deep sleep. It's advisable to drink plenty of water for the removal of toxins that have been released during the session. Often will the first shiatsu sessions, which is made to a patient produce a worsening of overall symptoms, encourage him to rest for one or two days. We call this healing crisis worsening. We must trust in the healing capacity of the body and continue with the treatment.